Fjola is a Nord warrior and the bandit leader of Mistwatch. Her aging husband Christer will ask you to find her during the related quest. However, Fjola has made a drastic career change and it is up to you to figure out how to solve it peacefully. 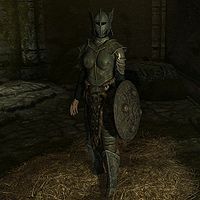 She wears a leveled set of heavy armor, which can be up to steel plate (or Nordic with Dragonborn add-on installed) in quality. She wields a leveled one-handed weapon with a chance of a shield, both of which may be up to ebony in quality. She also carries a spare leveled dagger that may be up to elven in quality, and a leveled amount of gold. She can be found in Mistwatch East Tower, from where she commands the Mistwatch bandits that protect the ruin. She just wanders around, without ever sleeping or eating, and will actively seek you out the moment you enter her premises. When she approaches you she will ask: "All right, snowback. Who are you, and what are you doing in my tower?" When you explain that you are looking for Fjola, she will be surprised: "Fjola? How do you know that name?" When you mention her husband Christer sent you, she will be even more surprised: "Christer? He's here?" The bandit leader will then admit what is going on: "The fool's my husband. I'm Fjola - or I was, once. Don't you see? I left that old scab. Came home to Skyrim, and found this rabble of bandits. Didn't take much to prove myself and knock them into shape. Now every free blade from here to Windhelm wants to sign on for a piece." When you tell her it is quite an unusual story, she will say: "And it won't end here. I'd die before I went back." "There's no way you'll come peacefully?" "None. Not back to him." Dialogue option disappears. "You think so? Let's see who the real woman is here." Draws weapon and attacks. "What am I supposed to tell Christer?" "I don't know. I never expected the old bag to follow me so far. Just get rid of him. But don't kill him. I don't hate the man. I just want him to go back to his farm and forget about me." A new topic appears. If you choose not to fight her, a new topic will appear. If you assure her you will get him to leave Mistwatch she will hand you her wedding band and say: "Take my wedding band. Stuhn only knows why I've kept it this long. He'll recognize it. Tell him whatever you think will convince him to leave. The ring itself is worth a few bits. Keep it as thanks for cutting off the last vestige of an unwanted fate." If you speak with her before confronting Christer, she will ask: "I didn't expect to see you again. What became of my doting husband?" and then brush you off with: "Then stop wasting my time." After dealing with Christer, you must return to Fjola to finish the quest. Regardless of how you dealt with her husband, she will be grateful: "How did... no, forget it. I don't care to know. I'm free of the little man, and that's what matters. I owe you a debt, and I aim to repay it. We'll see each other again someday. For now, goodbye, and thanks." The game actually presents her as "Bandit Leader", so you might accidentally kill her. Fjola will engage you in conversation even if you just killed all of her crew. You won't actually see her again unless you come back to Mistwatch. Nor will she ever actually "repay" any favours that she says she owes you. This page was last modified on 28 October 2018, at 06:12.